Methionine is an amino acid that is essential for many metabolic processes in the body. Typically, you get methionine for protein sources of food, so most people eating balanced diets get enough of it. However, there has been some previous debate about whether or not restricting your methionine levels in the body will be beneficial for longevity. What's the best way to balance this? Are there optimal levels? What should people who generally eat a lot of protein do? S-adenosylmethionine (SAM), which is a methionine carrier, is involved in the immune system, in structural components of the cell membranes, and in metabolism, especially metabolism of neurotransmitters including serotonin, dopamine and melatonin. SAM is heavily involved in DNA methylation, which is important for normal development with respect to DNA imprinting, X-chromosome inactivation, and healthy regulation of DNA transcription. However, there has been a growing amount of interest and science suggesting that restricting methionine levels in the body may lead to increased longevity. Below, we review current research on methionine sources, benefits of methionine restriction, and dietary balances regarding methionine. Methionine is an amino acid, and you would get it from foods that have protein. Regarding specific foods, the most prominent metionine sources are cheese, milk and tuna. 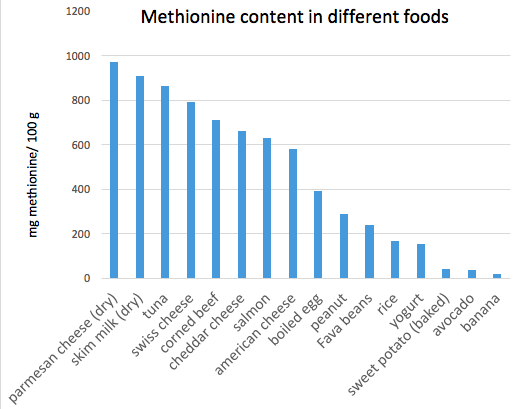 Amount of methionine (mg methionine per 100 g of food) in various sources. One study showed that a 40% decrease in methionine intake led to a decrease in production of reactive oxygen species in the liver.4IN the study, there was nearly a 60% reduction in various markers of protein lipoxidation (the process of breaking down key proteins) in the liver, in animals undergoing 80% decrease in methionine intake. It seems that restriction of methionine by up to 80% is beneficial for decreasing levels of oxidative, glycoxidative and lipoxidative damage in liver mitochondria. GSA: glutamic semialdehyde; AASA: aminoadipic semialdehyde, CEL: carboxyethyl-lysine, CML: carboxymethyl-lysine, MDAL: malondialdehyde-lysine. A methionine-restricted diet was shown to result in roughly a 7% increase in lifespan in mice. Despite the growing (but small) amount of evidence in animals, this postulation of methionine restriction being beneficial for humans, has not been rigorously tested in human studies. While there are studies on general protein restriction, there has not been a great amount of dedicated research on methionine restriction in humans. Future research should make greater efforts to understand this topic more, as the research in animals is promising. Most of the studies involving methionine reduction for decreases in oxidative damage / improvements in longevity, are done in animals. 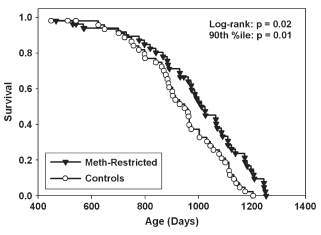 While the results are promising, there definitely needs to be more work done in humans, in order to fully round out the thesis that decreasing methionine is beneficial for long-term effects. While we don't recommend methionine-restricted diets at this time, this area of research is definitely worth paying attention to, going into the future. Luo, S., & Levine, R. L. (2009). 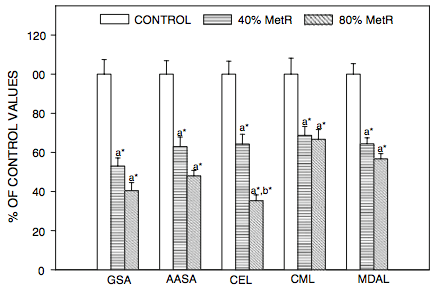 Methionine in proteins defends against oxidative stress. The FASEB Journal, 23(2), 464-472. Sanchez-Roman, I., & Barja, G. (2013). Regulation of longevity and oxidative stress by nutritional interventions: role of methionine restriction. Experimental gerontology, 48(10), 1030-1042. Caro, P., Gómez, J., López-Torres, M., Sánchez, I., Naudí, A., Jove, M., ... & Barja, G. (2008). Forty percent and eighty percent methionine restriction decrease mitochondrial ROS generation and oxidative stress in rat liver. Biogerontology, 9(3), 183-196. Deminice, R., Comparotto, H., & Jordao, A. A. (2014). Whey protein supplementation increases methionine intake but not homocysteine plasma concentration in rats. Applied Physiology, Nutrition, and Metabolism, 40(1), 46-50. Holstein, J. H., Schmalenbach, J., Herrmann, M., Ölkü, I., Garcia, P., Histing, T., ... & Claes, L. (2012). Excess dietary methionine does not affect fracture healing in mice. Medical science monitor: international medical journal of experimental and clinical research, 18(12), BR469. Meng, B., Gao, W., Wei, J., Yang, J., Wu, J., Pu, L., & Guo, C. (2013). Quercetin reduces serum homocysteine level in rats fed a methionine-enriched diet. Nutrition, 29(4), 661-666.